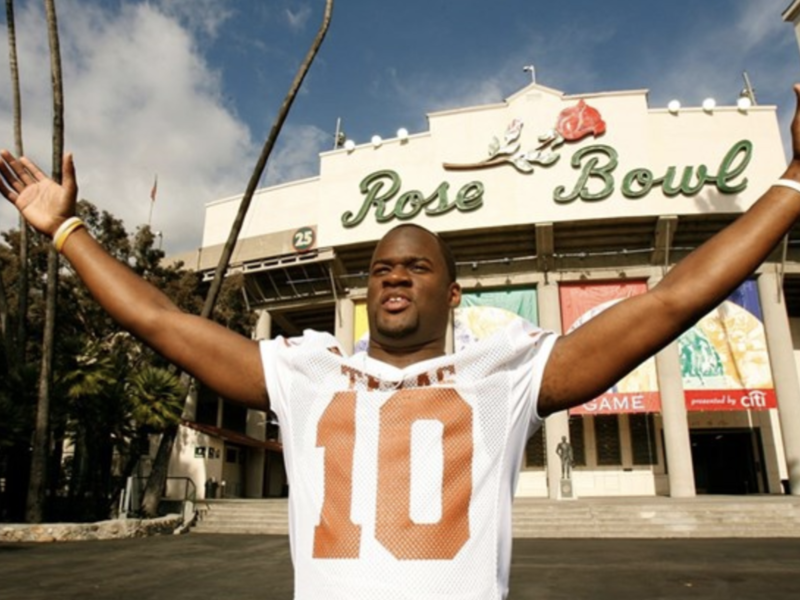 Long before he appeared on ESPN in bespoke suits or was a steakhouse impresario, Vince Young was just a University of Texas quarterback who happened to lead the Longhorns to their first National Championship in 35 years. On January 7, the National Football Foundation announced that Young will be forever enshrined in the College Football Hall of Fame as part of the class of 2019. Young will be the 23rd Longhorn to receive the honor, a roster that includes his coach, Mack Brown; Earl Campbell; Ricky Williams; and Darrell Royal. Young led the Longhorns to victory in 2005, and during his college career he was named an All-American, was short listed for the Heisman Trophy, and was the unanimous pick for Big 12 Player of the Year in 2005. He maintains UT's record for winningest quarterback with a 30-2 record as a starter; Young ranks sixth for wins among the NCAA. "It goes without saying that Vince was an unbelievable football player who greatly impacted college football and the University of Texas," Brown said in a statement via UT announcing the news. "He was a once in a generation talent. In the same statement, Young used the moment as a point of reflection, calling his induction "life changing." Said Young: "When I think about it, the honor is meaningful in so many ways and this award is full of reminders. It's a reminder that I came from a broken home and an under-resourced community where the odds are against us all. It's a reminder that I was given the chance to play for the University of Texas through the support of my family, hard work, and dedication. It's a reminder of the work my teammates and I put in, especially when no one was watching. It's a reminder of all the adversity we have gone through and overcome. And last, but not least, it's a reminder of all the awards, challenges, and championships my brothers and mentors have won together. None of us have accomplished anything alone, and I'm thankful for everyone in my life." After college, Young went on to play seven seasons in the NFL before returning to his alma mater as a development officer in UT's Department of Diversity and Community Engagement. In addition to his work with the school, he co-founded the Vince Young Foundation with his mother, Felicia. The nonprofit works directly with underprivileged children to improve academic and athletic excellence. "What I'll always appreciate more than anything with Vince is how he led our team, the way he worked, his passion and drive, how he made his teammates better and pushed us as coaches, and the way he represented our program," Brown continued. "He's a great football player and an even better person." The College Football Hall of Fame will honor its newest inductees during a ceremony in New York City on December 10. Young joins 12 other players, including Texas A&M University's Jacob Green and Oklahoma's Rickey Dixon, in the class of 2019.